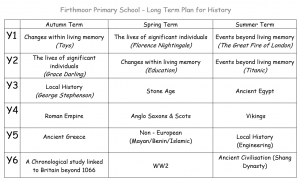 At Firthmoor Primary School, History is taught following objectives from the National Curriculum framework and is covered each term by looking at a new and exciting topic! 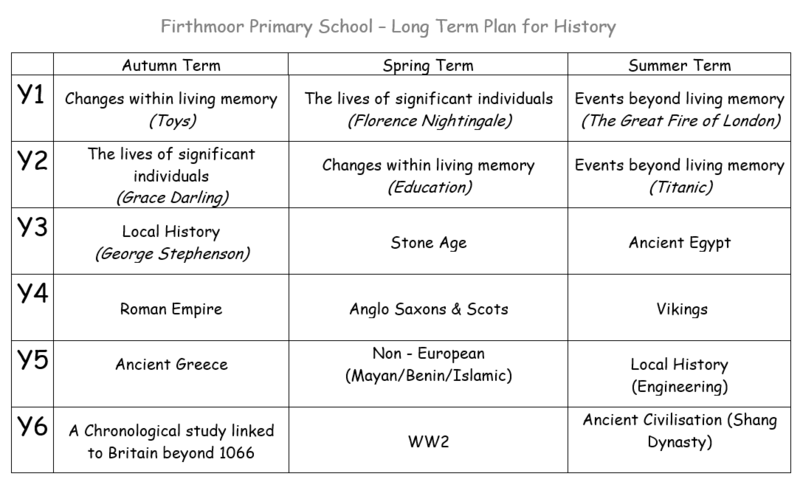 History can be taught in a block or weekly lessons. Children are encouraged to learn through research, using books, the Internet and looking at artefacts from the past. A fun way of learning about History is through inviting visitors into school and going on visits to places of historical interest. Classes have enjoyed activities at locations such as Hadrian’s Wall, Jorvick and Whitby Abbey. A group of girls even had the opportunity to listen to the author Kate Pankhurst speak on the topic of ‘Fantastically Great Women who made History’. The children have access to a plentiful selection of History books from across the eras, which are all displayed in the corridor for them to browse at their leisure.